If your blog copy and your web pages are boring and ‘me too’ – you’re dead. People have really short attention spans. Video, on the other hand, is engaging, it allows you to be authentic, and it connects you with your buyers. 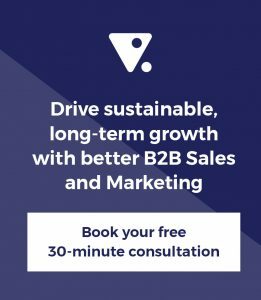 Today, I’m going to show you where and how to use video for B2B. In no particular order, let’s begin with cold outreach. If I’m about to make contact with you as a targeted prospect – and I’ve done a bit of homework about you – I can use video to evidence that I’ve done my research and prove that I’m not an idiot. Instead of a cold email or letter, I can send you a video that explains what I know about you, why I think we should meet, and along the way, demonstrate that I’m not an idiot. The second type is in ads. Facebook, in particular, are trying to become a strong video player to fight Google. To do that, they’re making their video ads more engaging and more affordable for us as marketers. Right now, using video rather than text ads delivers much better bang for buck. Thirdly, explainer videos help tell the story of your product in a very succinct and entertaining manner. HubSpot has put a great list of explainer videos together which you can view here. Corporate videos can also be a great way to tell the overall company story, but they’re likely to sit on the homepage or the ‘About Us’ page. I love using video in ads. A cold prospect who’s only engaged with us by seeing an ad is trying to quickly determine whether they want to know anything about us at all. Video is a great way to say, “We work with these people, doing these things, solving these problems”. You can get that across really quickly and persuasively in a landing page from an ad. We use videos in the help section for our online application, Funnel Plan. There are two reasons we use video for this. The first is that we can talk to the human and be there with them to help coach them – this is a very authentic and engaging technique to use. The second reason is that we can easily show on-screen something that is a lot harder to explain with just words. For example, you could have a small gif as the on-screen component and a little video to act as the engaging human coaching. This next one I’ve blogged about before, and it’s making an apology. About four months ago we screwed up with a client, and I felt really terrible about it. They were a great client and I needed to explain to them completely and succinctly that we regretted our actions. It didn’t matter whether it was our fault or not – we needed to apologise. I wanted to do it in a way that made it abundantly clear that this was wholeheartedly my view. Video is a great way to do that. By the way, it was very effective on this particular occasion. We’ve retained the client and we just grew them by adding a sister division. My point is, video is a great way to get your message across, particularly when it really matters, and certainly in the context of an apology. This next one is a weird example because it’s so obvious, but it needs listing: video blogs! Some time ago, I chose to do video blogs. I believed video would be more popular and more engaging. And now, we use it as a preferred medium of doing my weekly blog. 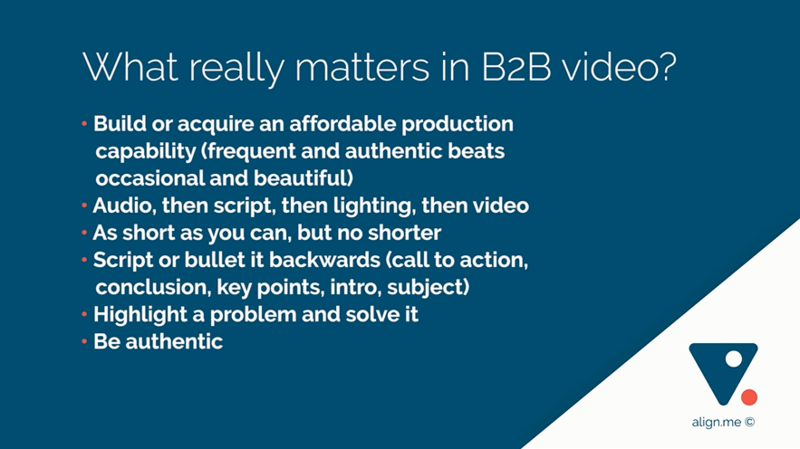 What really matters in B2B video? Well, it’s actually not the video itself. First, you need to build or acquire some form of affordable production capability – and this is something you can outsource. By the way, frequent and authentic beats occasional and beautiful. Just don’t overdo it. Have some capacity to turn a video into a hosted YouTube. Secondly, you need to do it in the right order. The video is actually the least important thing. Audio is critical, so get a decent microphone, and if you can, a good recorder too. The second most important thing is the script – what you say, and the order in which you say it. Next is your lighting, and then the actual camera. Why am I saying all this? Because 99% of videos that we think our customers should be creating can be done on a smartphone. Thirdly, make it as short as you can, but no shorter. It’s not that brevity matters, what matters is getting your point across quickly. Don’t waffle, but don’t cut yourself short. If you need five minutes or you need ten minutes, take it. Next, what conclusion would logically give rise to that call to action? What key points do I need to make for that conclusion to be sensible? Then, what introduction would get somebody listening to those key points? Finally, what’s my subject line? My second last tip is to highlight a problem and then solve it. And finally, remember to be authentic. Don’t worry about trying to come across as somebody that you’re not – just be enthusiastically you. I’m not talking about your hosting; YouTube is fine. What I’m saying is the right place in your overall process. So, for which elements of your overall process would it make sense to introduce the use of video? By the way, this should be all the way through to the end for customer testimonials. 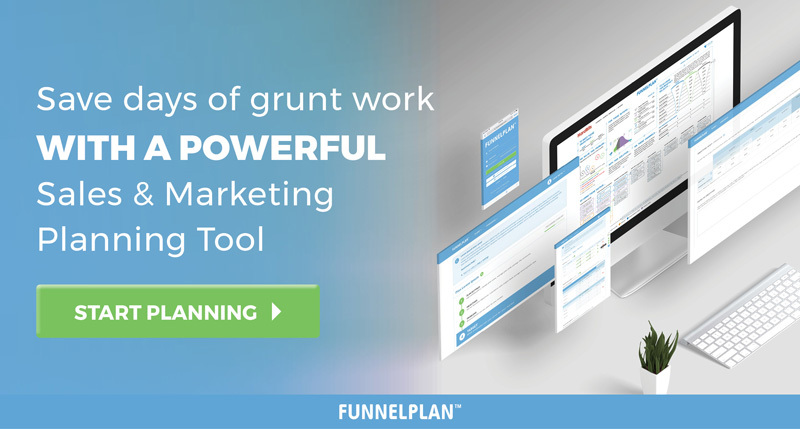 If you don’t have a Funnel Plan, go to Funnelplan.com and get yourself one now. I hope you got value out of this week’s show. I had fun putting it together for you. Lots more lined up for next weekend. Until then, may your funnel be full and always flowing.